162 pages | 1 B/W Illus. The influence of teacher expectations on student outcomes is routinely explored by professors, administrators, teachers, researchers, journalists, and scholars. Written by a leading expert on teacher expectations, this book situates the topic within the broader context of educational psychology research and theory, and brings it to a wider audience. 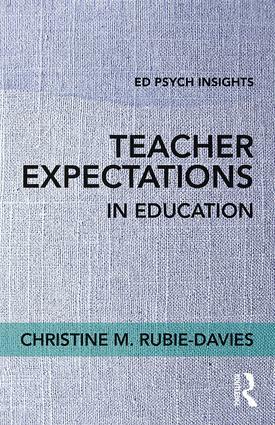 With chapters on the history of the teacher expectation field, student perceptions of teacher expectations, and implications for practice, this concise volume is designed for use in educational psychology courses and any education course that includes social-psychological aspects of classrooms in the curriculum. It will be indispensable for student researchers and both pre- and in-service teachers alike. "Christine M. Rubie-Davies is an internationally recognized scholar in the area of research on teacher expectations and classroom climate and student learning. In this book, she explains why teachers’ performance expectations are important, how they are communicated, and how they can be enhanced in ways to improve student learning. She translates this complex research topic and lucidly conveys the important, central messages embedded in hundreds of studies. This book is fundamentally important for those who plan to teach or those who conduct research on teaching." What has been learned and where to next? Christine M. Rubie-Davies is Professor of Education and is in the Faculty of Education and Social Work at the University of Auckland, New Zealand.